A good golf grip leads to a powerful swing. The way you hold your hands when you play golf can determine if you hit the ball straight or hook it into the water. The golf swing begins with your hands. Gripping the club properly is so important that it usually is the first thing golf instructors teach to new players. To master the grip you must hold the club without tension. Tension in your hands causes stiffness in your forearms and shoulders, making making it difficult to swing the club freely, resulting in wayward shots all over the golf course. Open your left hand (for a right-handed golfer) so the palm faces you. Place the handle of the club in fingers of your left hand. The handle should extend from the middle crease of your index finger to just past the fatty portion of your hand below the pinkie. Close your left hand to form one-half of the grip. With your hand closed and the club head touching the ground, you should see two knuckles on your left hand and your thumb just to the right of center. Open your right hand as if you're about to shake hands. Wrap your four fingers under the club so the handle stretches from the bottom of your pinkie to the crease of your index finger. 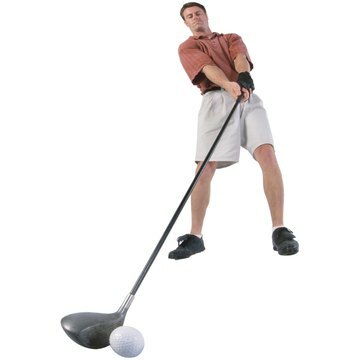 Your right palm should be just to the right side of the club and wrapped around the club to connect with your left hand. You may also interlock your right pinky finger inside your left forefinger or overlap the right pinky on top of the left forefinger. Raise the club to waist height in front of you with the toe of the club pointed to the sky. Have a friend pull the end of the club as you hold it. If your friend can easily pull the club from your hands, you're gripping it too lightly. Experiment with your grip pressure until you're holding the club just firmly enough to keep your friend from pulling it away. Sam Snead, considered one of the greatest golfers ever, encouraged people to imagine the golf club was a bird, and to hold on just tightly enough to keep the bird from escaping. Golf.com: Ask the Top 100: How Far Away From the Ball Should I Stand? What Is the Correct Golf Grip?